My buffer for Springside is complete. All the files have been uploaded. They are ready for your viewing as soon as they hit the schedule. I’ll be spending the next few weeks working on getting the house ready to move, working to bring you a terrific Summerside script and comic, and … yeah. I’m shaking, right now, literally. Springside has been a huge effort for me, and I hope you all will enjoy the rest of the story. Edit: I realize that I haven’t updated you on the doctor’s visit. My doc says I have osteoarthritic tendinitis in my shoulder. This came complete with a calcific deposit you could see on the X-ray previews. I wasn’t smart enough to take pictures to show you. D’oh. I’ll be headed to physical therapy starting this week, and hopefully that will help. For the record, eight sketches in one day is WAY more than I normally do. I usually can only manage four. I essentially did nothing else today. [Leanne] Check out what I made today. 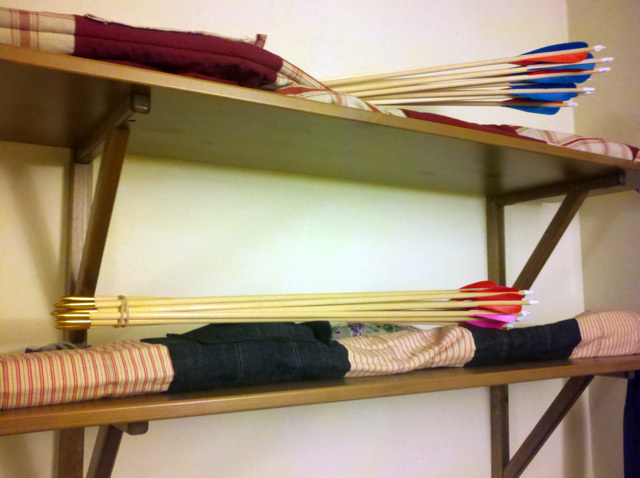 12 arrows, with momo-style fletchings. 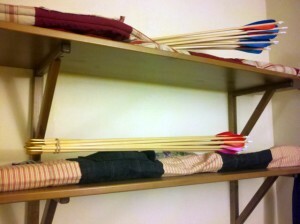 The ones on the top are Mark’s. He made a dozen too. I’ll admit, I cried yesterday when I heard that Steve Jobs had died. It was like losing Jim Henson all over again. I’ve used Apples since they were Apples, before the Mac. My first home computer (which I had to share with my brother) was an Apple IIe. My first computer of my very own was a Mac LCII. And I’m typing this on a Modbook, a modified white MacBook that’s been turned into a tablet. Steve Jobs and his company made the tools that make my work happen. And they are a joy to work with. The Apple, the Mac, the iPod, the iPad … they have shaped my life in so many very profound ways. I am so grateful, Steve. Thank you for all the great tools you made for us. Thank you for the innovation and the care in making it easy for the user. The world will not be the same without you.